Home to many great thinkers such as Erma Bombeck, Paul Laurence Dunbar and me, The Gem City is an integral area in the Buckeye State, and I'd like to thank an alleged bleach drinker for the nomination. Located in Montgomery County, Dayton was founded on April 1, 1796 and resides in the valley of the Miami River (The Miami Valley). It is the sixth-largest city in the state based on population, and according to the National Parks Service, was like a fine wine just needing to age well. On the one hand, the Dayton of 1900 was, quite literally, the average American city. The precise center of U.S. population had passed right over the top of Dayton in 1870. Thirty years later, the 1900 census placed Dayton at the statistical center of the top ten cities in the state (5th) and the top 100 cities in the nation (45th). You just can't get much closer to the statistical center of middle America than turn-of-the-century Dayton. There were some tough times for Daytonians, though, as there was quite the flood in 1913. But we're not here to talk negative. The city is well-known due to two brothers and former residents achieving the first successful flight in a powered aircraft. But Dayton truly thrived in the in the late 1800s and early 1900s due to two men: John H. Patterson and Charles F. Kettering. Patterson got his start in 1882 when he and his brother invested in the National Manufacturing Company, which sold many products including cash registers, invented in 1879 by fellow Daytonian James Ritty. After a large amount of success, Patterson bought Ritty out and renamed the firm the National Cash Register Company (NCR). Currently, however, NCR is now a computer software, hardware and electronics company and has moved its world headquarters to Duluth, Georgia. One man benefitted from his time working for NCR, and now has a suburb in the Gem City named after him. Who? 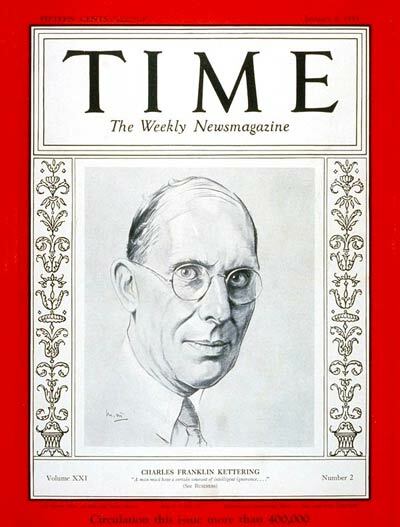 Ohio State alumnus Charles F. Kettering. Kettering worked in the research department at the company before teaming up with his colleague Edward Deeds, who convinced Kettering to develop improvements for the automobile mobile ignition. Both wanted to spend as much time as possible on the project, so they left NCR and incorporated as Dayton Engineering Laboratories Company, or Delco in 1909. After tireless hours of work, Kettering's effort paid off. Kettering was involved in a number of research projects at Delco, inventing a portable electric generator and many important automobile innovations. With the success from the invention, General Motors purchased Delco in 1916, just seven years after it began. You know what's cooler than having a suburb named after you in your hometown? Having a park in that suburb in your hometown named after the company you started — which Kettering also has. Oh yeah, and let's not forget his soft-smile for TIME magazine in 1933. Honorable Athlete Mention: Brady Hoke. He definitely does not look the part now, but the guy is a former Ball State linebacker. He's a former coach of TTUN though, so he stays off my list. Collectively, Dayton, Ohio is one of the more interesting cities in country, and with a copious historical background, it has made its mark on the map of the Buckeye State. You may think I'm a homer for letting my hometown win this category, but it won on it's own. Next week, Discover Ohio will feature the city in the Buckeye State that has the best food and restaurants. I like to eat, a lot, but I have not been to every hole-in-the-wall dive in the state. So I could use your help making my decision. Leave your nomination next week's superlative in the comments below, and go tell your friends you just received a history lesson on Dayton, Ohio. You're welcome.